When medium Tess Schafer hears about a cursed tombstone in Bucksport, Maine, she makes that town her next destination. From the moment of her arrival,Tess knows she’s stumbled into a paranormal treasure trove. Her curiosity fully aroused, Tess is determined to solve the mystery surrounding the town founder’s involvement with a witch and the curse she is purported to have cast. Hindering things, however, is the spirit of an imposing Native American Indian. Who is he, what does he want and how is he connected to the curse? He isn’t her only problem, however, for her presence hasn’t gone unnoticed among the rest of Bucksport’s ghosts. It isn’t long before she’s getting chased around by a pack of spirits and learning enough of the town’s peppered history to realize there’s more going on there than anyone can imagine. Although she’s dealing with more than she bargained for, Tess knows the place is haunted for a reason and she means to find out what it is. One thing for sure, the town has secrets and its ghosts have decided to bring some of them to light. Since the town of Bucksport, Maine, truly exists and the legend of Colonel Jonathan Buck also exists (though it’s “truth factor” is quite nonexistent), I thought it only fair to set the record straight as to what is fact in Hidden Voices and what is fiction. I tried to keep true to Bucksport’s actual history since I found it colorful enough to add flair and credibility to my fictional story. Colonel Buck has earned, unfairly and unjustly in my opinion, a smudged reputation due to a stain that appeared on his graveside monument. 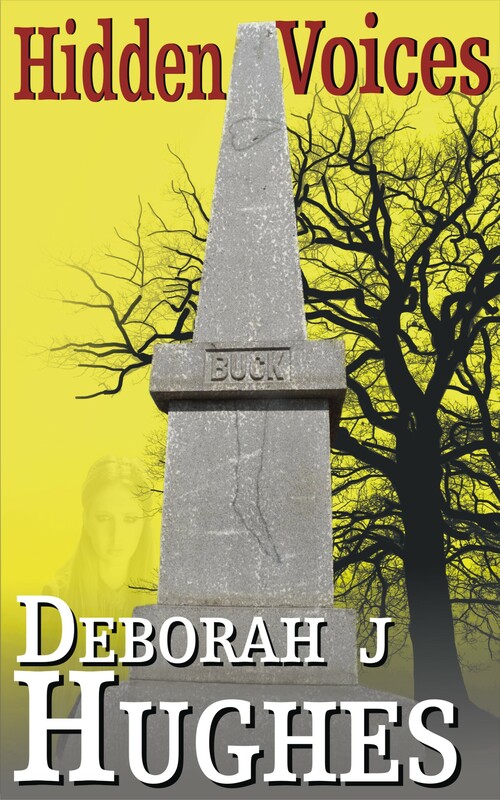 As I grew up in Bucksport and was always fascinated with the eerie legend, I thought it would be pretty cool to use my creative writing endeavors towards the invention of my own story concerning the legend. None of it is grounded in fact. If Buck’s monument is cursed, there is no documentation anywhere to suggest why such a thing would have reason to occur. He was a devoted husband and father and he was highly respected among the citizens of Bucksport and the local area. His children grew to become just as admirable and respected. My story is a complete fabrication other than the specific historical data given here. I took creative liberty to reinvent the legend and use historical facts and actual historical figures, such as Jonathan Buck and the Red Paint Indians, to make it more interesting. I do want to make clear, though, that any other relative of Buck’s used in this story (save for his son, Jonathan Buck, Jr.) is completely fabricated. Although it’s a shame to have one’s name so unjustly tarnished as Buck’s has become, the legend has given the town of Bucksport a distinction from others. Who knows why that stain appeared on the monument like it did? God put it there, and since ALL things happen for a reason…maybe Tess’s conclusion is more accurate than not! In any case, I like her version of the legend much better! First, I must talk about the Red Paint Indians for they truly were believed to have existed. They were thusly named because of the red ochre found in their gravesites. Several of those gravesites were in fact found in Bucksport and Orland (the two towns border each other and I lived in both during the first 19 years of my life!). Since these Indian natives went extinct several thousand years ago, there’s not much left in their gravesites to garner information concerning them. Some historians have speculated their connection to the Beothuk of Newfoundland because of their shared interest in red ochre (the Beothuk covered themselves in the stuff) but that is as much argued against as for. Who knows for sure? No one. And because of that, I can make up whatever I want concerning them, right? That’s what writers do…they take creative license to make up stories and use actual data sometimes, to do it! So now I’ll move on the Colonel Buck’s true story. He sailed into the Penobscot harbor in June of 1763 on his sloop “Sally” and cast anchor. With him he brought his family as well as a few other determined settlers and they all got to work forging a life and building a town, then called Plantation No. 1. In 1779, the Revolutionary War came to the area when the British began constructing Fort George in the Penobscot Bay vicinity of present-day Castine (then called Plantation No. 3). The fort was intended as a stronghold for attacking American privateers operating against British shipping. Their naval blockade effectively shut off communications and supplies to the settlers of Plantation No. 1. Short of food and powder, facing almost certain extinction and losing several of their children due to starvation, town authorities sent off a message to the General Court of Massachusetts seeking aid. Massachusetts sent a fleet of ships and a force of over 1000 men to dislodge the British from the fort. Colonel Buck took part in this effort along with other volunteers from the surrounding local area. The 21-day battle that followed resulted in one of the greatest fiascoes in US military history. Until Pearl Harbor, it remained the largest naval defeat. Survivors, to include Colonel Buck, were forced to flee for their lives. A quick return home to pack up what possessions they could carry, Buck and his family, along with many other citizens of Plantation No. 1, left their homes and rowed or walked their way to safety. The day after the naval disaster ended, the British sloop NAUTILUS dropped anchor in the harbor of Plantation No. 1 and the crew went ashore to pillage and burn the properties of the departed patriots. The few settlers who remained, by pledging allegiance to the crown, were spared. Colonel Buck and his family did not return until a treaty was signed with the British in 1783. In 1789, the people of Plantation No. 1 petitioned the Court for permission to incorporate Plantation No. 1 as the town of Buckstown- honoring by its name, Colonel Jonathan Buck (in 1817, the town was renamed Bucksport). 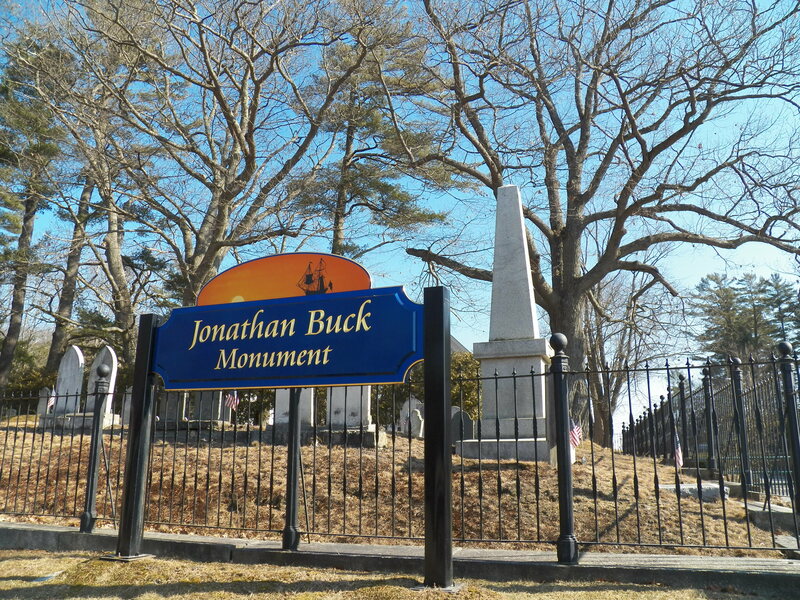 Jonathan Buck, Jr., was named the first Justice of the Peace for the Penobscot area and so reigned a just and righteous family, respected and admired, their reputation unblemished until a stain appeared on a graveside monument. Jonathan Buck died on March 18, 1795. In August of 1852, his grandchildren, thinking this prominent member of their family, the founding father of Bucksport, Maine, should be honored for his contributions and importance to the town’s existence, erected a monument near his gravesite. Shortly thereafter, a weathered image in the form of a woman’s leg appeared under the Buck name. The image of a heart also appeared near the top of the obelisk. Although their appearance sparked intense speculation and rumor, the first record concerning it didn’t appear in print until March 22, 1899. The Haverhill Gazette’s article recounting the Buck legend has become the more popular version although there are certainly many variations on the theme. None of that, of course, actually happened but the tale was now in written form and that’s as good a truth. Right? Whatever caused the images to appear, the fact is they do exist. Although it is rumored that attempts were made to remove the images and failing that, it was replaced several times, there is no official record of such a thing actually happening. Over the years, people knowledgeable about monuments have explained that the “stains” are the result of a natural flaw in the stone, perhaps a vein of iron which darkens through contact with oxygen. The problem with this explanation is that any flaws in the stone would have been present at the time the monument was being made. So, who knows why those images are there. God did it. That is the only reasonable explanation (unless, of course, you are an atheist and in that case, well, you are welcome to come up with your own explanation). I took fictional license to make up my own story, and I think it’s a pretty good one … who knows, maybe I’ve channeled through bits of truth. Or not. I think it’s sad that this legend has unjustly tarnished the excellent reputation of an upstanding citizen. Jonathan Buck was respected and admired. His extensive family were model citizens and many of his sons became prominent members of society. Most of them were devout Christians, were hard-working, honest, charitable and caring. They persevered during trying times and because of that, we now have a solid community in which to live and grow. Although I’ve written a story that puts the legend back in the limelight (however small that may be! ), I do hope that I’ve given better credit to Colonel Buck’s memory. May he rest in peace! Hidden Voices will be available on Amazon Friday, 24 August 2012!